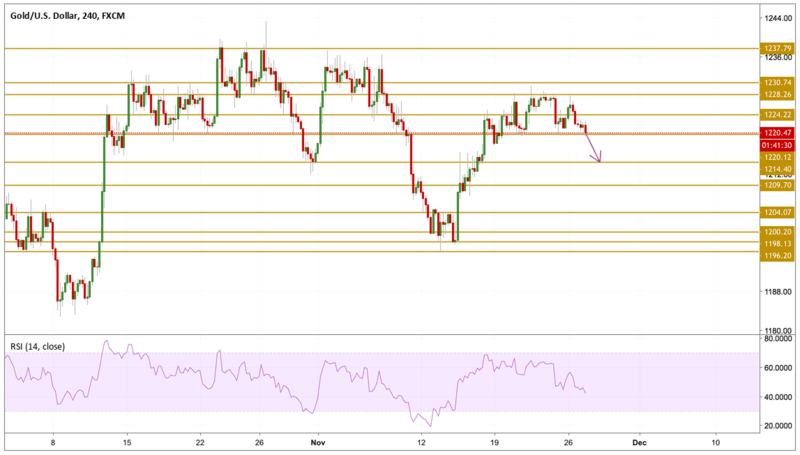 Gold failed to preserve its modest daily gains on Monday and fell to a daily low near $1220 as the higher risk appetite made it difficult for safe-havens to find demand. Reports of Italy looking to reduce its deficit target to satisfy the EU and the EU27 approving the Brexit deal helped European stocks gain traction on Monday. On top of that, the US Dollar index rose by 1% above the 97 mark to make it difficult for the yellow metal to recover its losses. Yet again, Gold prices failed to break and settle above the $1228.26 resistance level and headed back towards the $1220 support level. The yellow metal seems to be loosing traction with the falling momentum as we can see on the chart. That is why we will be watching the $1214.40 support level.